Hardcover with jacket, 816 pages, 13.5 x 21.5 cm, 5.3 x 8.5 in. 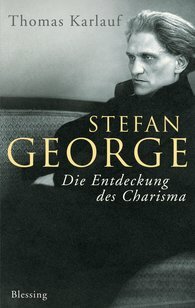 The first biography of Stefan George in German. Stefan George was, without doubt, one of the most influential of the German poets in the first third of the 20th century; his impact on German literature was decisive. He owes his fame, however, less to his poems than to the fact that he managed to stage himself to the public as few before him. The circle of men utterly loyal to Stefan George known as the George Circle – controversial then and now – was legendary. It was this circle of enraptured and enthusiastic youths that Max Weber used to develop his idea of "charismatic rule". Stefan George is an example of what power over people really means. In his work, there are several points of contact with National Socialism (George died in 1933), and many people saw him as having "paved the way". And yet, at the end of this way, we have the attempt on Hitler's life on July 20, 1944; it was made by Claus von Stauffenberg, one of George's last confidants.